When talking infill development in Stockton, Downtown garners the lion’s share of attention, and rightfully so. Downtown Stockton has a perfect street grid structure, strong transit hubs, a plethora of architecturally significant buildings and lots of open lots. These characteristics make the neighborhood the premier spot for infill in Stockton. But the conversation about infill should not stop at Downtown. There’s actually several other sites in the city that would make great infill projects or transit corridors, though they are not quite as obvious to most Stocktonians. Here are my picks for the best areas in Stockton for infill development NOT located in Downtown Stockton. I’ve included maps of potential parcels purely for illustrative purposes to show where development opportunities might lay. Take a look and vote below on which area is most ripe for infill. As you can see, there’s a lot to pick from. One can easily envision mid-rise apartments with ground floor retail sprouting along this route on any of the various empty lots. The downside is that the road itself is incredibly inadequate, as SCL pointed out last year in our “five worst streets in Stockton” feature. The road shrinks down to one lane in each direction and there are literally no sidewalks and next to no street lighting, turning a simple walk to 7-11 into a harrowing endeavor. This area is technically part of the county at the moment (which explains the terrible road conditions), so there would have to be major upgrades to make this corridor attractive to developers. However, the city has in the past identified the corridor for future improvement. And RTD’s Bus Rapid Transit Route 40 terminates just to the south at Hammer Lane, which raises the prospect of extending this popular service to the residents of this neighborhood. Let’s hope Thornton Road is reborn as a true “complete street” with bike lanes, easy pedestrian access, and, yes, more car lanes—everyone wins! This is not a new concept. Known as “gray field development,” many malls across the country are undergoing transformations similar to what I’ve laid out above. As part of the New Urbanism movement, vast parking lots serving underutilized retail centers are now considered prime territory for redevelopment, and the best part is, no farmland has to be sacrificed! This roughly 60 acre piece of land offers a blank waterfront canvass for an intrepid developer. The location is ideal for many reasons: It’s relatively secluded, offers access to the water, and already has a major corporate headquarters (Duraflame’s head offices are located on the Klamath Ferry, moored at the mouth of that small bay). The site is also situated along the city’s future “Waterways Connection” project which will hopefully one-day link Downtown Stockton to Louis Park via a waterfront promenade. But there are some serious obstacles that a developer would have to overcome to truly turn this into a thriving Stockton neighborhood on the water. First and foremost, the site is almost certainly contaminated from whatever industrial activity used to be housed on the site. This would require costly environmental remediation. But there are federal and state programs to help cover these costs. In fact, these “brownfields” grant programs were used by the city years ago to create Dean DeCarli Square. Another obstacle would be the Port of Stockton which would most likely object to any development so close to their operations. Large ships many times arrive in the middle of the night which can be loud for neighbors, and the port probably doesn’t want to deal with any more noise complaints. Still the potential of a site like this in any other city would be very intriguing to the development community, I would hope there would be similar interest here. Unlike Thorntorn Road, a lot of the infrastructure is already in place. The streetscape has already been spruced up and is now quite inviting. More importantly, RTD’s Route 44 BRT already travels along this corridor. The lack of investment in South Stockton has always been a sore subject, but the opportunity is there. In fact, Financial Center Credit Union is building a new branch on Airport and 10th. Hopefully this is just the beginning of new investment along this vital south side corridor. So there you have it. What areas do you think are best for development? Take our poll below. David, I think of all the 4 candidates you mentioned in your article, the Airport Way Infill-Greyfield Corridor seems more pragmatically primed for immediate redevelopment and infill mixed-use. As you relayed, it already possesses the transit corridor infrastructure, new sidewalks and streetscaping leading to the Metropolitan Airport, as well as the south-side employment destinations at the various industrial centers surrounding it, while also featuring transit northbound into Greater Stockton. In terms of foremost priority this certainly could be the first area to viably and comprehensively tackle; ideally jumpstarting needed renewal, urban and commercial/business vibrancy in South Stockton, which is long overdue and urgently strategic. 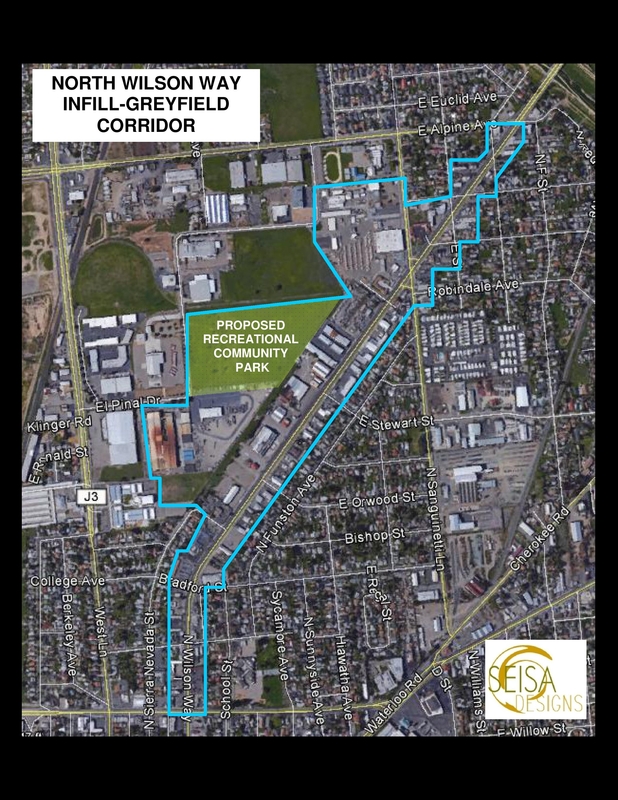 The isolated North Channel Infill-Greyfield Corridor lacks a major transit corridor, unlike all the other candidates’ transit expansion potential where a much higher volume of traffic already commutes directly through those areas. Additionally, with industrial port activity directly across the channel, a residential development might be less appealing and too risky for investors, and the view deemed too industrial for homeowners. But there can be other options for this area that might be more applicable, perhaps institutional in orientation. 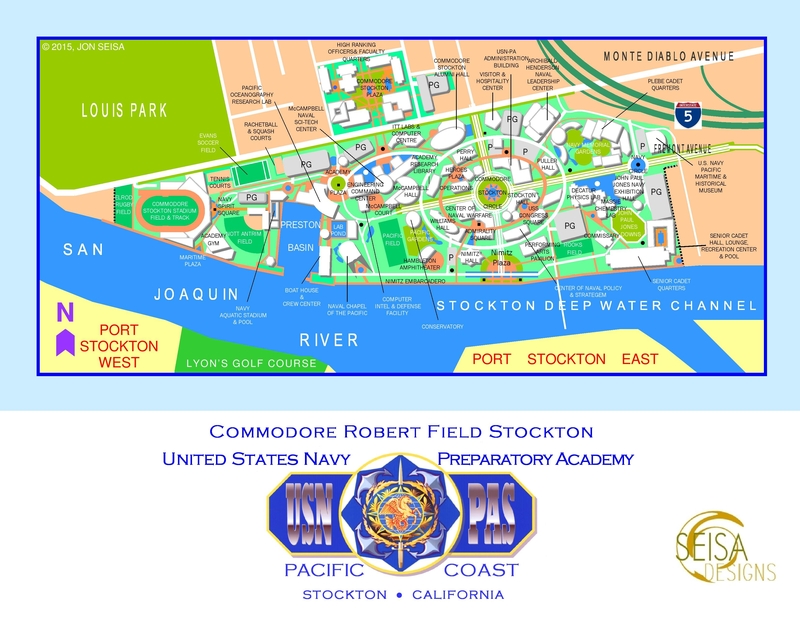 I have always felt in so many advantageous ways that a West Coast U.S. Navy secondary preparatory academy under the namesake of Commodore Robert F. Stockton could be very strategic in this location and in Stockton; a real shot in the arm for regional education and local pride. The Mall Infill-Greyfield Corridor would be best developed if the inner vacant lots located on the corners of Claremont and Woodstock were delegated for construction of 4 to 6-level parking structures and the vast flat expanse of parking at street-grate-level and in front nearest Pacific Avenue was entirely used for more commercial/business and mid to high-density residential mixed-use infill development (even a 4-star high rise hotel located somewhere on the site) with smaller street-grate-level parking lots sprinkled throughout, landscaping, and underground residential parking integrated. I really think the Weberstown Mall and Sherwood Manor Mall should both be ambitiously unified, expanded and merged by a developer into a mega-mall for the future mushrooming population of Stockton, and bridged together with internal access to both adjacent main structures, and the whole entire area revamped under a new lifestyle ID branding auspice themed to “Pacific” reiterating the “Pacific Avenue” name from its namesake UOP, perhaps naming this mega-mall and district something along the vein of— “Pacific Gardens”. The mall shopping experience today is more experiential with open air plazas, fountains and garden walks, some of this should be incorporated to quantum leap these malls into the 21st Century. The Thornton Infill-Greyfield Corridor is certainly a natural and should eventually be developed sooner than any later date into a complete street as you have suggested. It is a major inbound north gateway into Stockton and needs to be upgraded into something more inviting that will simultaneously upgrade the city’s image. The neighborhoods that flank Thornton Road deserve better, shame on San Joaquin County officials for this long-lasting negligence. David, besides these sites, another potential 5th option that I think would be extremely ideal and viable for infill-greyfield redevelopment, and urban renewal in general (escaping brownfield designation), is the derelict and underused real estate of the North Wilson Way Corridor from Harding Way northward past Sanguinetti Lane to the intersection of Alpine Avenue and North Wilson Way, a total of 1.3 miles, precisely, being a 25 minute casual stroll. Currently, there are several vacant and dilapidated light industrial lots, old car sales lots, unsightly chain-link fencing, aging small rickety light industrial shops, muffler, auto repair and body shops, RV sales lots and low-standard motels strung along this route. This neglected and underutilized area can be completely rezoned and de-industrialized to gain more land continuity open for mixed-use infill commercial/business, hostelry-hospitality and mid-density residential redevelopment, converting this entire aging light industrial area into an attractive and bustling “Stockton Gateway” with, alas, a prominent memorial statue featured in a key plaza or intersection to the street’s noble namesake, President Woodrow Wilson, returning to Wilson Way it’s long absent dignity. It can be transformed from the mundane into a robust new commercial district, resurrecting Wilson Way in a very big way… “Come shop, stroll, dine, live and play… ENJOY YOUR DAY ON WILSON WAY.” This corridor has direct, immediate and convenient access to Golden State Highway 99 to the northeast and can also be a main inviting artery into the core of Stockton which should be capitalized upon in a beautiful and vibrant infill endeavor with sidewalk cafés, galleries, boutiques, artist lofts, streetscaping, new sidewalks and street lighting, bike lanes, brickwork crosswalks, transit lanes, walkability-friendly features (seating areas), garden meridians, public art, fountains and shade trees. Additionally, there is enough open land on the west side bordered by El Pinal Drive and the Coca-Cola Bottling Company to develop the additive amenity of a recreational community park for the local neighborhoods and new infill residents to use, as well as daytime employees in the area to enjoy during lunchtime. Literally, this area has great potential and is a blank canvas craving to be reconceptualized into a dramatic new destination.